In the lab loading a piece of paper into a dielectric spectrometer for fiber analysis. Growing up in New Orleans, Louisiana, I had no scientific aspirations as a child. I do remember being entertained by science, relishing public television programs such as Newton’s Apple, Bill Nye the Science Guy and Square One, but I never saw science as a career path. It was not for lack of encouragement or female role models; my own mother, an immigrant from Greece, at one time seriously studied chemistry before deciding to pursue a degree in archaeology. Even my high school chemistry teacher, Mr. Fonte, saw my potential, and in front of a classroom of my peers declared that I would become a chemist one day. But I simply had other interests in mind, and I declared myself an English writing major throughout most of my college days, with the goal of entering the publishing industry as a writer or an editor. Toward the end of my undergraduate career, I had a change of heart and a change of majors. I never looked back and presumably shut the door entirely on the world of publishing forever. Or at least until December 2007, when I was hired as a chemist in the Testing and Technical Services Branch at the United States Government Publishing Office (GPO). Just blocks away from the U.S. Capitol and under the aegis of the Legislative Branch, the GPO’s mission is to “Keep America Informed.” We produce all of the U.S. government’s official documents—everything from the Pocket Constitutions given out to permanent residents preparing for their citizenship tests, to the “Medicare and You” guides to assist seniors across the country in enrolling for their health benefits, to secure credentials such as the U.S. Passport. In order to print these documents and countless others for agencies across the federal government, the GPO is responsible for procuring the paper and ensuring it meets certain technical specifications for each of these print jobs. This involves physical and chemical testing of paper for printability, runnability, durability and permanence. Other than my abandoned publishing ambitions, I had zero background in either the paper or printing industries when I was hired. To be honest, like most ordinary people, I thought paper was pretty dull, and thanks to its ubiquity, I generally took for granted how much paper serves us in our daily lives. My graduate chemistry work was on elucidating the crystallographic transitions of cathodic materials used in lithium rechargeable batteries, which most folks would agree is way sexier. Admittedly, it took a while for me to gain enthusiasm for paper science and the technical side of printing and publishing, although perks like being able to access the subway under the Capitol building and the honor of working on high-profile projects like presidential inaugurations and performing analyses at the request of members of Congress did help. Among the pieces of knowledge I had to acquire for my job at the GPO was something called fiber analysis, a process by which I had to certify that the paper we purchased was indeed manufactured with the fiber composition specified by the procurement contract. Fiber analysis is an important evaluation for high-value printing substrates. For instance, a paper with 50 percent cotton fiber is more expensive than one with 25 percent cotton fiber. In the case of security papers such as social security card paper and passport paper, fiber analysis takes on even greater importance. Ensuring the fiber composition is consistent and meets specifications is both a matter of national security and civil rights. If all people are equal under the law, the quality of the documents issued to them by a governmental authority should be consistently high, and the ability to authenticate the validity and origin of those documents borne by any two individuals should be equally simple. American sycamore paper pulp at 100x. To perform fiber analysis, an analyst must receive specialized, hands-on training at a week-long course (“Fiber School”!) to learn to identify fiber species by color and morphology through an optical microscope. This requires the memorization of scores of plant fiber species, many of which look a lot alike or cannot be resolved from one another, from pre-prepared samples and images in photo atlases. What we see under the microscope is not a fragment of paper but a glass slide onto which a droplet of a solution with individual fibers suspended throughout is allowed to air dry. 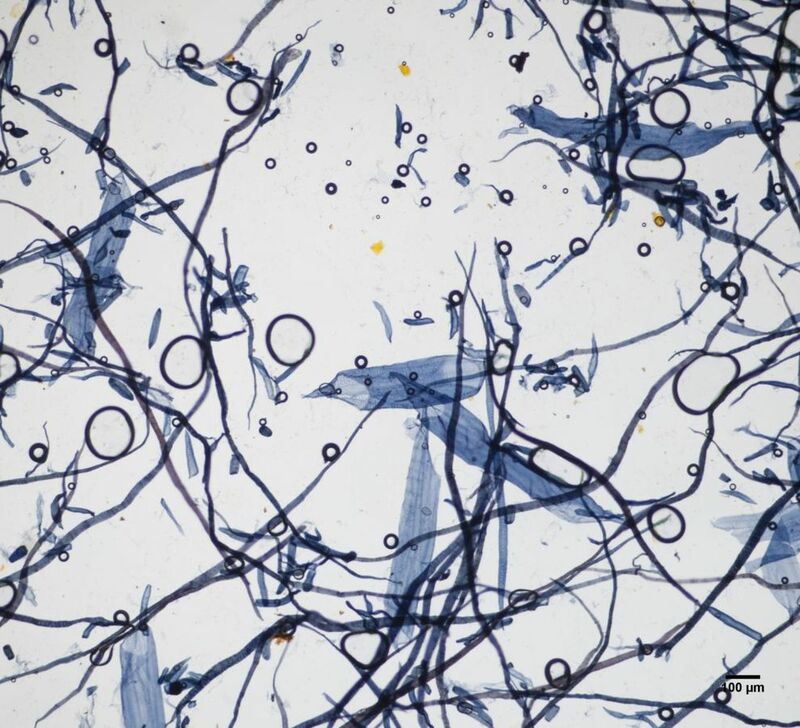 The fibers adhere to the glass and are later stained with an iodine-based reagent so as to become discernable. Liberating those individual fibers from a paper sample requires tearing a portion of the sheet of paper, boiling it in water, and mashing it into a little ball. After chemically treating and rinsing this little ball several times, the fibers are finally freed into solution. To report the ratio of fiber species present, it’s necessary to count and keep track of each and every fiber present (of which there are hundreds!) by monotonously pressing on a hand counter. An analyst can easily spend two to three hours on this test method before getting a result. I completed Fiber School in April 2010. Among my classmates was a paper conservator, though most of the students had been employed in some capacity by the paper and pulp industry. I was told that federal law enforcement agencies put their scientists through the same grueling and anachronistic paces. The thought that a destructive analytical method that is so highly dependent on the visual acuity of a human analyst can put people behind bars made me shudder. Not only that, despite the investment of time and effort that goes into executing fiber analysis, there is no way that this technique, nor any other analytical technique out there, could solve a problem of great economic importance—verifying the recycled fiber content in a sheet of paper. I knew there had to be a better way, and I wanted to find it. In 2016, I was excited to join NIST as a guest researcher and work with their scientists. I took it as a good omen that on my very first day as a guest researcher, I discovered that the NIST Museum had dedicated exhibition space to 2011 Nobel Laureate and NIST guest researcher Dan Shechtman, the discoverer of “quasicrystals” who experienced years of sustained and unrelenting obstructionism, public ridicule and ad hominem attacks on his scientific competency and personal integrity. To call this exhibit an inspiration is an understatement. It became a shrine for me, and it made me decide to make the NIST Research Library, which adjoins the museum, my base camp for turning fiber science on its head. I spent a great deal of time in the NIST Research Library trying to master the underlying concepts of dielectric spectroscopy, an analytical technique that two of my NIST colleagues, Yaw Obeng and Jan Obrzut, are experts in, and which we applied to the problem of developing a new, nondestructive, objective, machine-driven means of fiber analysis. Late one evening, I was strolling through the NIST Museum when an image flashed across a monitor. 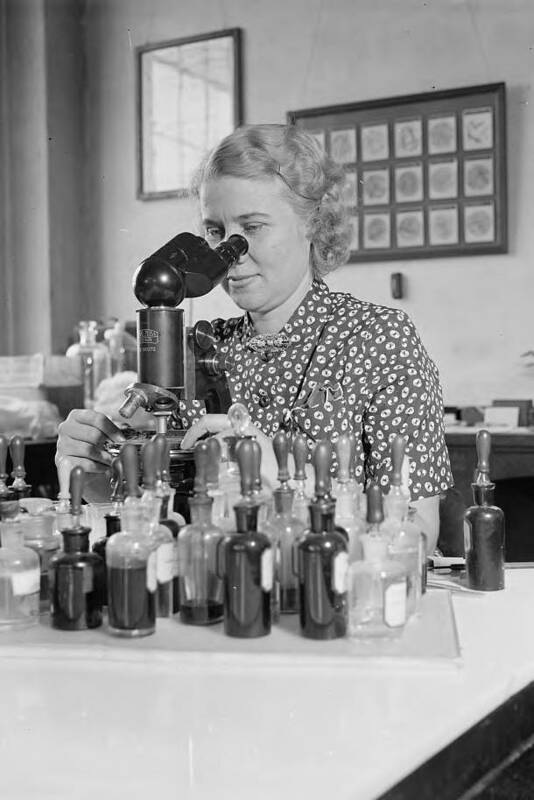 In a black and white photograph was a woman with the same optical microscope and chemicals that I was using to perform fiber analysis downtown at GPO. I had to wait about five minutes for the slide show to return to that initial image to read the caption—Mary Rollins, NBS expert on paper and conformance testing, 1937—and another subsequent five minutes to capture a photo of the image on my phone and text it to everyone I knew. The discovery of documentary evidence that fiber analysis had not moved an inch in 80 years cemented the importance of what I was trying to accomplish at NIST, but it also intrigued me. The paper and pulp industries have been traditionally male-dominated, and even today, men outnumber women at conferences and industry events. Who was this other Mary? How did she become a U.S. government scientist in 1937? And, most importantly, why did no one know her name or acknowledge her role, considering the groundwork for fiber analysis was originally established here at NIST when it was known as the National Bureau of Standards (NBS)? Mary Rollins worked at NIST from 1929-1938, specializing in the identification of papers and fabrics and their conformance to industry standards. She spent the remainder of her career at the U.S. Department of Agriculture, where she became an international authority on using electron microscopy for textile research. Besides having the same first name, Mary Rollins and I both were born along the Gulf Coast. She earned her bachelor’s degree at Newcomb College (Tulane) in New Orleans; I graduated from Loyola next door. Later, she migrated to the D.C. area and earned a master’s degree from George Washington University, and eventually was employed by NBS as a fiber technologist specializing in the microscopical identification of textile and paper fibers. She contributed substantially to the development of traditional fiber analysis and helped compile data with meticulous microscopical work on many grades of paper. However cumbersome and onerous traditional fiber analysis is by today’s standards, in Mary’s day, she was a trailblazer, along with another female scientist, Muriel Merritt. Ten years after that photo of her was taken, Mary Rollins returned to New Orleans to work at the United States Department of Agriculture (USDA) Southern Regional Research Center on a then-state-of-the-art and cutting-edge microscopy technique—scanning electron microscopy—and developed improved methods of textile processing. Even more surprising was that she attained a level of seniority unheard of for a woman in the late 1940s, as she led the Microscopical Properties Section of the USDA’s Cotton Fiber Research Division. Although my expressed purpose in coming to NIST was to have the opportunity to work on overturning the method that she was instrumental in bringing forward, I’m nonetheless in awe of what she was able to accomplish considering the limited opportunities and expectations of women in her time. Much like the medium that she devoted the bulk of her professional career to studying, Mary Rollins’ contributions, and the contributions of other female federal government scientists, have been largely taken for granted. Yet, the impact and popularity of the film “Hidden Figures” should be an indication that society is hungry to learn more about the pioneering female scientists, engineers and mathematicians that the U.S. government took a chance on in decades past when no one in the private sector would. My NIST colleagues and I continue our work on fiber analysis via dielectric spectroscopy with the goal of developing an internationally recognized test method and standard reference materials. We have been able to detect and quantify recycled fiber content—a feat that was supposedly scientifically impossible—and we are looking to expand our work to assist other disciplines, namely secure document design, forensic science and archeology. I will always be grateful for the chance that NIST gave me to better serve the American people. It’s my hope one day that someone intrepid and determined will come after me and decide my work is outmoded, outdated and requires a new paradigm. I know NIST will be here to give that someone an opportunity to succeed.